TechWorks starts Tech2 construction | Vandewalle & Associates, Inc.
WATERLOO, IA: Construction has officially begun on the Tech 2 building at Cedar Valley TechWorks Campus. 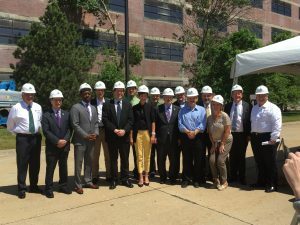 Local and state officials were in attendance— including Gov. Terry Branstad and Lt. Gov. Kim Reynolds, along with officials from TechWorks’ parent organization, the Greater Cedar Valley Alliance & Chamber, Waterloo city leaders and representatives from the Iowa Economic Development Authority. As the next phase in a process already spanning more than five years, The Tech 2 building will become a Courtyard by Marriott Hotel, John Deere Training Center and restaurant. It’s a “significant step” in the continued progress of developing TheGreen@TechWorks project. 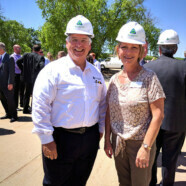 Governor Branstad spoke at the event: “It’s a great reuse of this old production facility for John Deere and really building for the future and making sure we’re preparing young people from this Cedar Valley area for the jobs that are coming and that are already here,” he said. “The campus and the Green@TechWorks are a great example for other communities to emulate,” the Governor told the audience. “The progress you’ve made here is phenomenal. It took patience and perseverance to see it through.” The Green@TechWorks is part of the larger 33-acre TechWorks Campus. In addition to the Tech 1 and Tech 2 buildings — which Deere & Co. donated to the project — the campus includes parcels suitable for light manufacturing and retail. 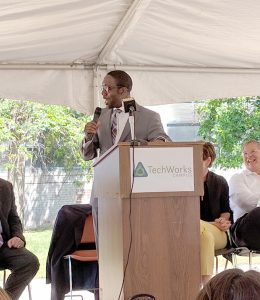 TechWorks is “the first technology park of its kind in Iowa to combine world class business amenities within a Brownfield redevelopment site,” said Steve Dust, who directs the project, as well as the Alliance & Chamber. Read the full Waterloo-Cedar Falls Courier article here.